We call our Lodge Room ‘Lancashire’s Little Gem’ (LLG). It is small and quite cosy. Decked out with oak panelling reputedly from Whalley Abbey via a house that was later demolished. The panelling was installed and carved by a local craftsman and is quite impressive. But don’t take our word for it. We will happily show you around the Union Club and our beautiful Lodge Room by arrangement and we have been known to have Open Days too. The accompanying photograph is of one side wall with images of two founder members and a couple of displays. The Lodge Room was redecorated in time for Abbey Chapter’s Centenary celebrated on Wednesday 2 December 2014. 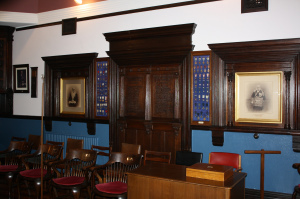 Back in the late 19th Century when Abbey Lodge was founded the membership stretched to around 12 gentlemen so the room was furnished with quite substantial chairs some of which can be seen lower left in the photograph. Today Abbey Lodge can boast a significantly large membership and on occasions the original seating has to be exchanged for more modern slimmer chairs so that all the members and visitors can be accommodated. 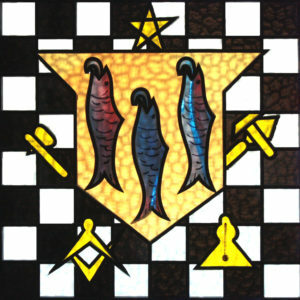 Ironically, Abbey Lodge celebrated its centenary in 1994 at Freemason’s Hall in Manchester whilst the Chapter’s centenary mentioned above was celebrated at Nelson House in Burnley. All because of the limitations of space within Lancashire’s Little Gem. One comment we hear often is ‘I didn’t know you were there’. People pass our building without really looking at it but all the signs that Freemasons use the building are there. Next time you pass take a look at the front gate complete with masonic emblems or the front door with its small brass plaque. Should the front door be unlocked sneak a peak at the vestibule door which has a colourful window. 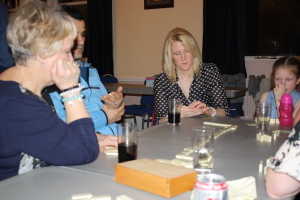 The upper floor of the building is given over to our social area where we dine after our meetings. On warm spring or autumn evenings (we don’t meet in the height of the summer) the upper windows might be ajar in the evening allowing the sound of people socialising with the chink of cutlery on crockery and the odd round of applause for a good response to a toast. Want to know more? Please use the secure form on our Contact Us page.